Today was Halloween. There was no pumpkin. I shouldn’t have worried, as usual. There were over 25 people there, and even though I decided at the last minute to speak in Russian, everything went smoothly. We played the old classic children’s game of reaching into a bag with a “body part” inside and trying to guess what it really is — a peeled tomato for a heart, a pile of cold spaghetti for brains, grapes for eyes, and a dried apricot for an ear. They loved it. After all the things I had planned were done, there was an awkward pause that could have gone badly, but they urged me to tell a ghost story, even though I could only do it in English. I chose the only one I remember well, the one about the travelers who stay at a mysterious house for the night and are awakened by a troll in the closet repeating over and over, “Now I’ve got you right where I want you, now I’m gonna eat you!” The punchline is that the troll is picking his nose and talking to his boogers. Figures the only ghost story I know is a funny one. It went over well, and spurred them on to tell their own stories, most of them true, about spooky or mysterious things that had happened to them or their grandmothers. There were ghostly figures in mirrors and dead grandfathers appearing in photographs and one story about someone swimming away from a concentration camp during the war. I wasn’t able to follow all of the stories, but listening to the way they told them, the phrases they used to start them, the way everyone else recognized the frames, the “Once upon a time”s, was wonderful, sitting there in the candlelit classroom. This is why I went into comparative literature, because I am fascinated by the way people tell stories. And even though there was no pumpkin, there were rice krispie treats! I may have been the only one who fully appreciated the marshmallowy goodness, but pulling off two batches of homemade rice krispies on the day of the event was quite the triumph for me. Unfortunately, two dozen treats used up all my marshmallows, so I will have to go back to Moscow to get more. Wait… did I say unfortunately? My diplomatic pouch finally arrived in Moscow! The reasons for going back are stacking up! I have at last arranged to have tutoring sessions once a week with a professor from the Russian department. Russia is not participating in Daylight Savings Time this year, so after next weekend, I will be 9 hours ahead of the East Coast instead of only 8. I enjoyed shrimp for the first time yesterday– all I needed was to have it prepared in Russia by a Pole. There are six inches of snow in central PA and zero in sub-arctic Archangel! The winners of the mummy race! 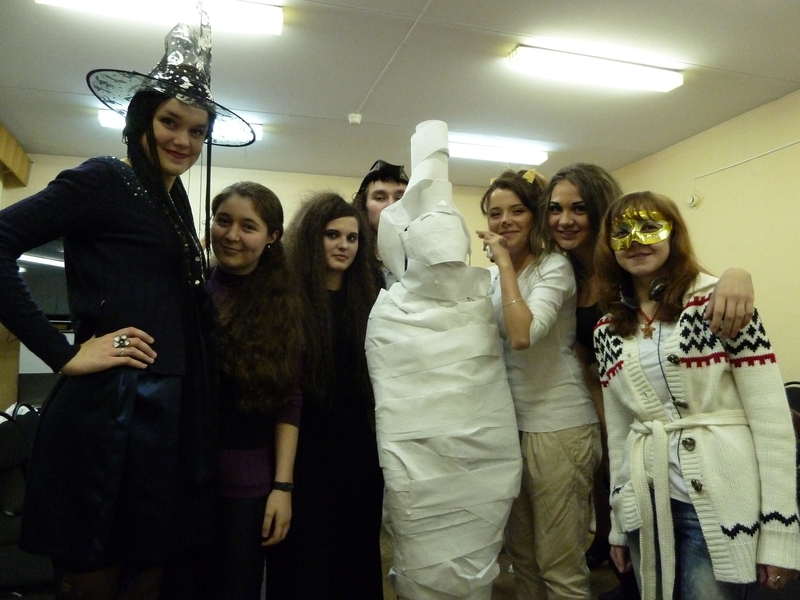 This entry was posted in ESL Teaching, Living in Russia, People and tagged archangel, arkhangelsk, halloween, marshmallows, russia, stories by Ruth. Bookmark the permalink. Wow, great party. I guess it reveals another failure, in that I didn’t scare you to death with ghost stories. You could have gone “Sleepy Hollow” on them, though likely they have seen the Disney version. So, who are the high school girls in the picture?